The author selected the Wikimedia Foundation to receive a donation as part of the Write for DOnations program. 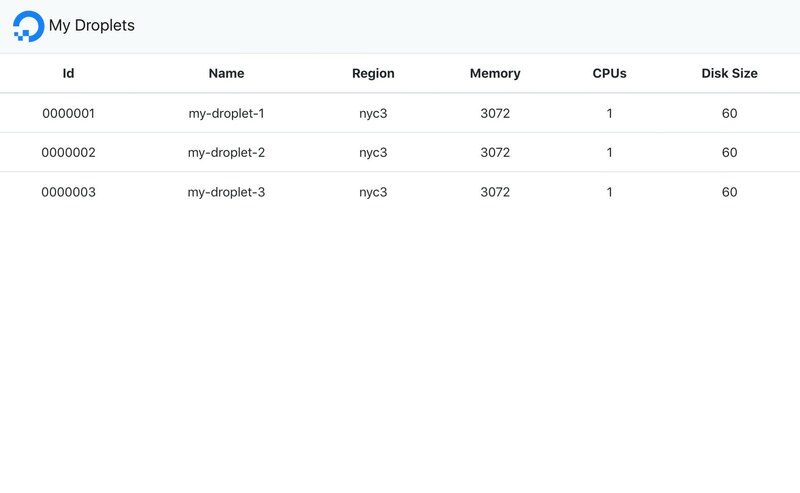 In this tutorial, you will create a simple React application that interacts with the DigitalOcean API v2 to make calls and retrieve information about your Droplets. Your app will display a list containing your current Droplets and their details, like name, region, and technical specifications, and you will use the front-end framework Bootstrap to style your application. The preceding command starts a local development server provided by Create React App, which disables the command line prompt in your terminal. To proceed with the tutorial, open up a new terminal window and navigate back to the project directory before proceeding to the next step. Now that you have installed and created the first version of your React application, you can add a table component to your app that will eventually hold the data from the DigitalOcean API. In this step, you will create the first component that displays information about your Droplets. This component will be a table that lists all of your Droplets and their corresponding details. The DigitalOcean API documentation states that you can retrieve a list containing all of your Droplets by sending a request to the following endpoint using cURL: https://api.digitalocean.com/v2/droplets. 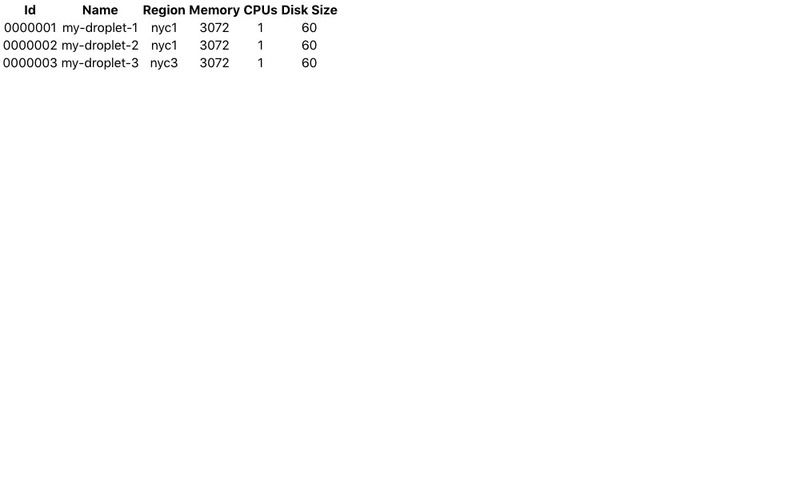 Using the output from this request, you can create a table component containing id, name, region, memory, vcpus, and disk for each Droplet. Later on in this tutorial, you'll insert the data retrieved from the API into the table component. The code block above imports the React framework and defines a new component called Table, which consists of a table with a heading and a body. When you have added these lines of code, save and exit the file. With the nano text editor, you can do this by pressing CTRL+X, typing y, and pressing ENTER. 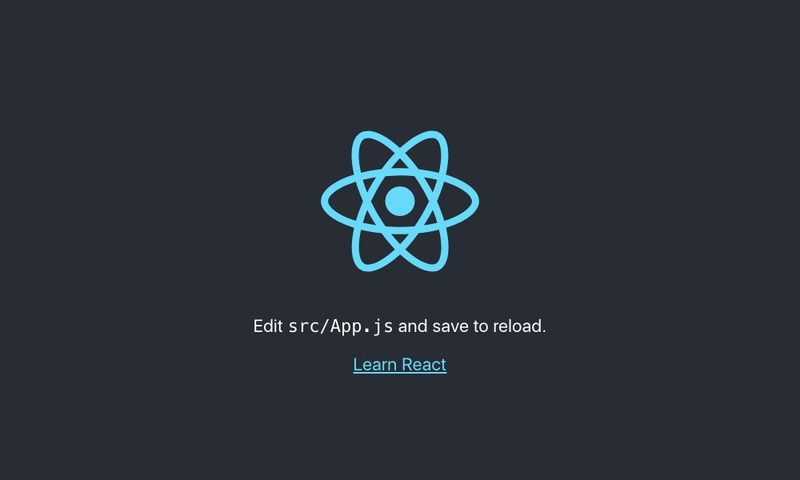 Next, remove the boilerplate code that displays the Create React App welcome message in src/App.js, which is highlighted in the following code block. In this step, you have created a table component and included this component into the entry point of your application. Next, you will set up a connection to the DigitalOcean API, which you'll use to retrieve the data that this table will display. Setting up a connection to the DigitalOcean API consists of several actions, starting with safely storing your Personal Access Token as an environment variable. This can be done by using dotenv, a package that allows you to store sensitive information in a .env file that your application can later access from the environment. You have now created a safe and simple configuration file for your environment variables, which will provide your application with the information it needs to send requests to the DigitalOcean API. To ensure your API credentials aren't visible on the client side, you will next set up a proxy server to forward requests and responses between your application server and the DigitalOcean API. In the preceding code block, const apiURL = sets the url for the DigitalOcean API as the endpoint, and const apiToken = loads your Personal Access Token into the proxy server. The option pathRewrite mounts the proxy server to /api rather than / so that it does not interfere with the application server but still matches the DigitalOcean API. You've now successfully created a proxy server that will send all API requests made from your React application to the DigitalOcean API. This proxy server will make sure your Personal Access Token, which is safely stored as an environment variable, isn't exposed on the client side. Next, you will create the actual requests to retrieve your Droplet data for your application. These lines of code call a constructor method in your class component, which in React initializes the local state by providing this.state with an object or objects. In this case, the objects are your Droplets. From the code block above, you can see that the array containing your Droplets is empty, making it possible to fill it with the results from the API call. You have now created the functionality to retrieve data from the API, but you still need to make this data accessible via a web browser. In the next step, you will accomplish this by displaying your Droplet data in your table component. In this step, you have modified the table component of your application to display your Droplet data in a web browser and added a placeholder message for when there are no Droplets found. 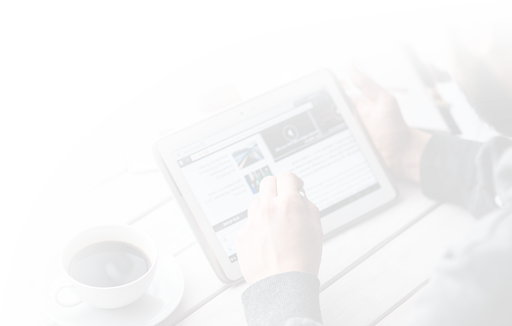 Next, you will use a front-end web framework to style your data to make it more visually appealing and easier to read. Your table is now populated with data, but the information is not displayed in the most appealing manner. To fix this, you can style your application by adding Bootstrap to your project. Bootstrap is an open-source styling and component library that lets you add responsive styling to a project with CSS templates. Now that you have imported the CSS, apply the Bootstrap styling to your table component by adding the class table to the <table> tag in src/components/Table.js. In the preceding code block, the classes within the nav tag add a particular styling from Bootstrap to your header. In this article, you've created a basic React application that fetches data from the DigitalOcean API through a secured proxy server and displays it with Bootstrap styling. Now that you are familiar with the React framework, you can apply the concepts you learned here to more complicated applications, such as the one found in How To Build a Modern Web Application to Manage Customer Information with Django and React on Ubuntu 18.04. If you want to find out what other actions are possible with the DigitalOcean API, have a look at the API documentation on DigitalOcean's website.